Transcutaneous electrical nerve stimulation, or TENS, is a method of stimulating the nerves to reduce pain and stimulate muscle tension for toning. Various TENS units are available that provide different ranges of therapy based on frequencies, pulse rates and amplitude ranges, according to doctors at Memorial Hospital in Towanda, Pennsylvania. TENS units are utilized by professional physical therapists as well as patients at home. The devices are small, battery-powered units that only weigh a few ounces. Clean the skin around the area where you plan to use the electronic stimulation. Use an alcohol swipe or clean with an antibacterial soap. Dry the area completely before attaching the electrodes to prevent skin irritation. Insert the ends of the cords into the disposable pads that come with the device. Extra pads can be purchased for home use. Always use a clean pad for a treatment. Peel off the adhesive backing on the pad and place the pad on the area to be treated. Follow the advice of your doctors and only use the machine on recommended body parts. Turn on the machine to the settings at which you've been instructed to use. Many physical therapists will preset the TENS units they provide to clients. Patients should maintain the settings recommended by the therapist. Increase the intensity of the electrical input gradually so as not to shock the muscles. Again, you should have instructions as to how high to turn up the unit for each treatment. 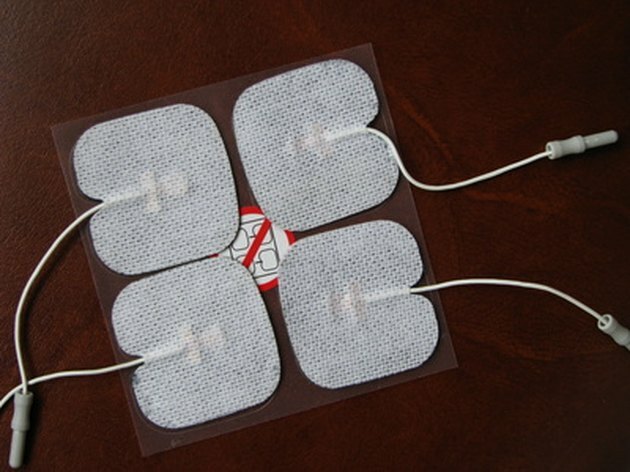 Use a TENS machine for 30 minutes to an hour to feel relief, or as long as prescribed by your therapist. Some patients find they need a couple hours with the unit attached for the best treatment. Remove the pad after a treatment and dispose of the pad. Moisturize the area with lotion to ease any skin irritation that may have occurred and to prevent redness. Make sure the adhesive pad is completely stuck to your skin to avoid intermittent electrical charges, which can cause skin irritations and mitigate the effects of the treatment. If you continue to get skin irritations after using the TENS unit, try a different brand of pads. Manufacturers use various kinds of adhesives, so look for one that does not irritate you. Keep hairy spots shaved or trimmed to allow for a cleaner attachment of the pads. Most patients who use a TENS machine receive instruction from a physician or physical therapist. Always follow those instructions when continuing the therapy at home to avoid any further complications. If you feel your muscles start twitching or jumping, turn down the intensity of the unit until the spasms stop. What Are the Treatments for a Pinched Nerve Between the Shoulder Blades? How Do I Get Rid of Laser Hair Bumps?